Greenland’s tidewater glaciers are losing mass, through thinning and retreat, at an increasing rate. Greenland’s glaciers located north of 78 North latitude often end in ice shelves, floating extensions of the glaciers extending up to several tens of km into the adjacent fjords. While most ice shelves of North Greenland have been relatively stable, Petermann Gletscher lost more than 40% of its ice shelf area (36 giga tons) during two major calving events in 2010 and 2012. What remains of Greenland’s ice shelves is threatened by a changing climate, because both regional air and ocean temperatures continue to increase while Arctic sea ice cover continues to decline. Petermann Gletscher through calving events. White lines show ICESat tracks; blue (ambient ice shelf) and red (central channel) show repeat-track airborne surveys. 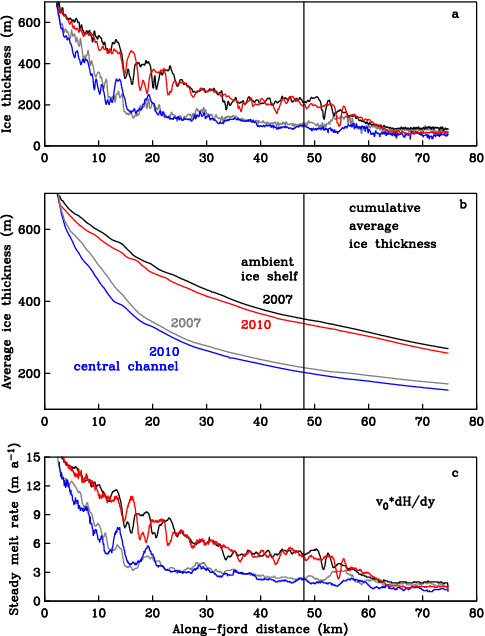 (top) Change in ice thickness from 2007 to 2010 from repeat airborne missions. (middle) along-track mean thickness. (bottom) steady-state melt. In our study we distinguished between 1. a thinning of the floating ice shelf that moves along the glacier as new ice moves from the Greenland ice sheet on land out into the ocean and 2. a non-steady thinning at fixed locations as time passes. The situation is somewhat similar to the flow through a pipe (or river, if you wish) with a constriction. If the same amount of water entering the pipe comes out at the other end, then the flow has to speed up where the pipe becomes narrow. A floating glacier is not quite like water flowing through a pipe, because the ocean underneath and the air above can melt ice making the floating ice shelf thinner as it flows along. If the ice thickness changes along the floating glacier, then melting must take place for a glacier moving seaward at a constant rate. 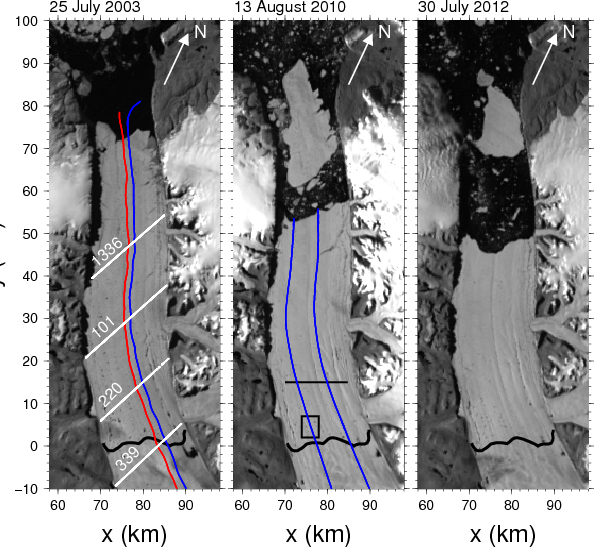 The ice thickness changes along the glacier, but stays constant at a fixed location. This is the steady-state melt. Our study will appear later this year in the Journal of Glaciology, but pre-prints can be downloaded here. The U.S. tax-paying public funded this study via grants that we received from NASA and NSF. They also funded substantial efforts to make sure, that all data reside in the public domain accessible to anyone anywhere. This entry was posted in Greenland, Petermann Glacier and tagged climate change, glaciers, Greenland, NASA, Petermann. Bookmark the permalink. Nicely done, I really like Figure 7 in paper as well. Even though thinning is a bit less from along fjord distance 60 km -75 km, the ice is quite thin here and thence he percentage loss is amazing.